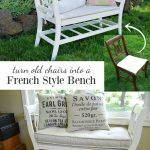 Get AOC's newsletter + access to a library full of printables! 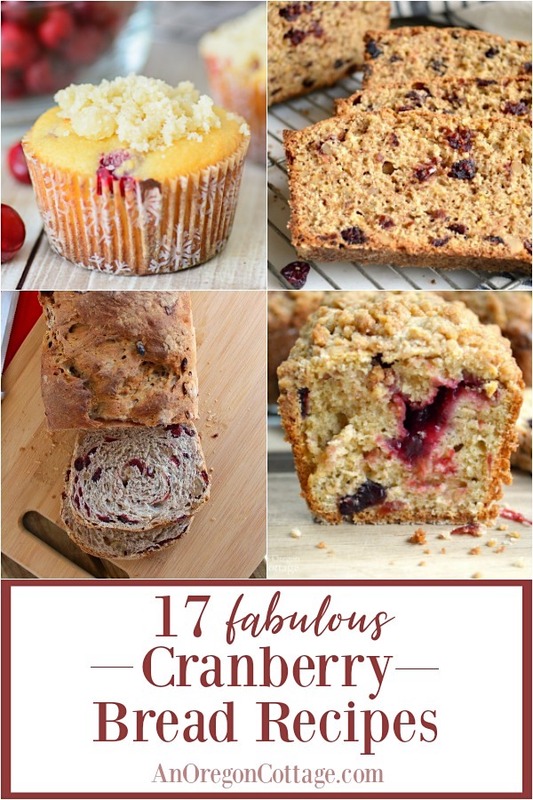 I’ve gathered some wonderful cranberry bread recipes – both loaves and muffins – that would be perfect for fall and winter baking. Holidays and cranberries go hand-in-hand – how about making a loaf, wrapping it up and gifting it to a neighbor or a friend? Those are the best kind of gifts in my book! Need gluten free? Two breads and a muffin are featured below. How about paleo? I found a really yummy looking option for that, too. Like to add nuts, or combine cranberries with apples or lemon? Check, check, check. See? 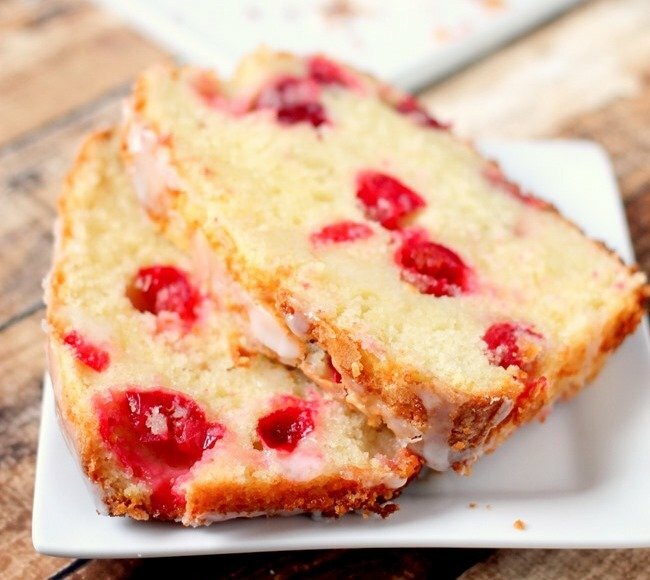 I wasn’t kidding – these are some of the best bread recipes that feature cranberries. 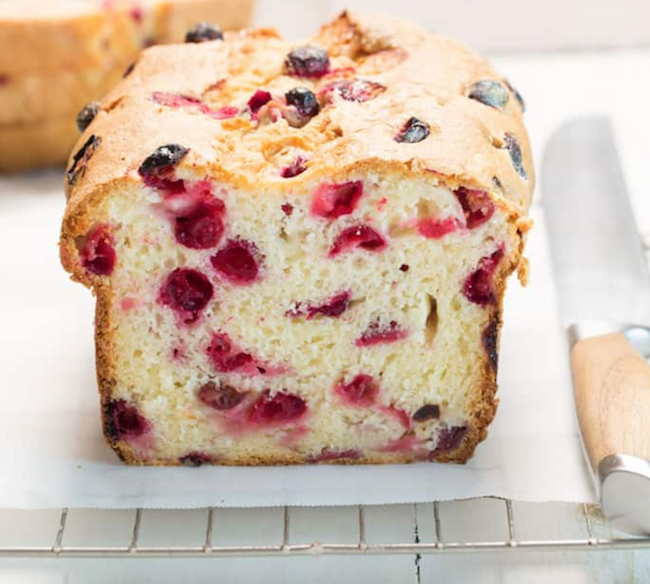 While we normally think of cranberry bread in the fall and holiday season, it’s really good any time of the year. I like to buy a couple extra bags of cranberries to freeze and bake with after the main season – and of course dried cranberries let you have your cranberry bread, muffin, or scone fix whenever you want. 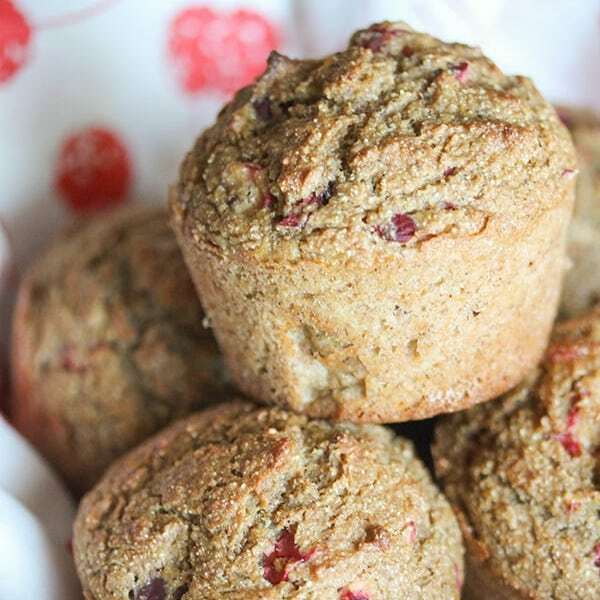 After I published this favorite cranberry bread recipe, I started thinking about what other kinds of breads and muffins there were that used these tart-sweet fruits that are typically available only in the fall and winter months. And wow, did I find some good ones that use both fresh and/or dried cranberries. Using the recipes below, you can choose from typical sweet quick breads that include apple, pumpkin, and lemon flavors (or even more sweet with a white chocolate frosting! ), as well as a couple of yeast bread options, gluten free cranberry breads, and even a paleo muffin. I now have plenty of options for those bags of frozen cranberries! 100% Whole Wheat Orange Cranberry Bread. This is my favorite cranberry bread that I’ve been making since college. 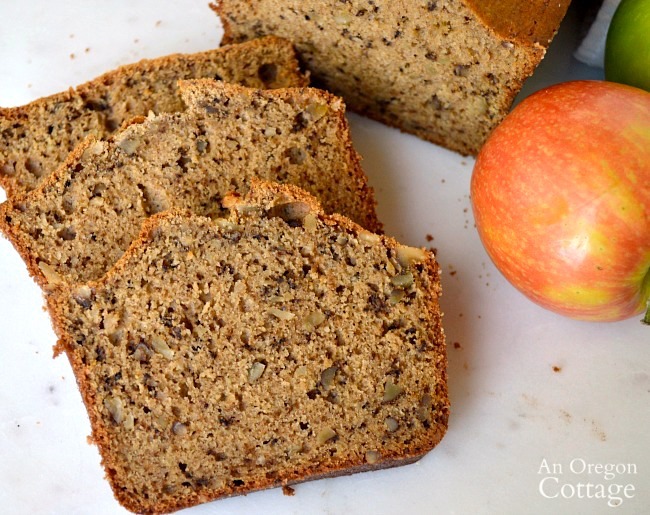 I’ve updated it to use whole wheat and less sugar and this is a case where I like it better than the original. 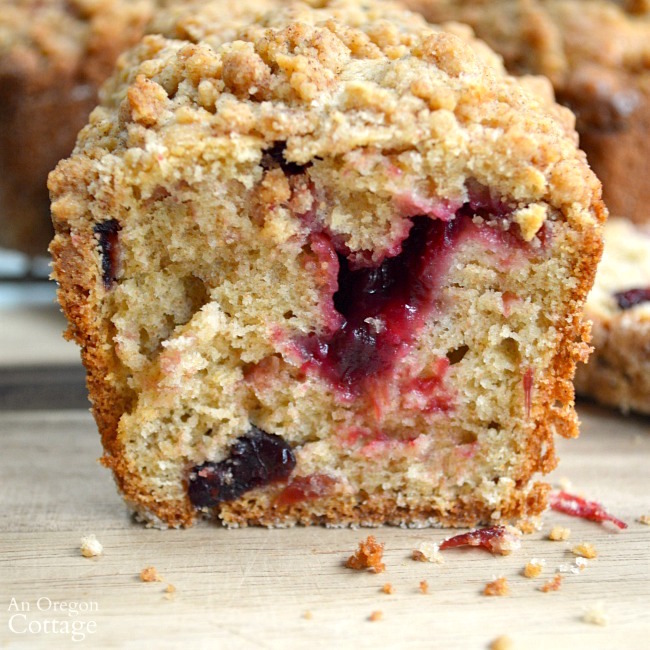 Cranberry Crumb Little Loaves or Muffins. Baking these mini loaves/muffins at the holidays are a tradition – I add them to our goodie bags filled with other baked treats for friends and family. You can make these with either leftover cranberry sauce or fresh cranberries – the recipe also calls for dried cranberries which amps up the flavor for sure. “Cranberry” Applesauce and Spice Bread. 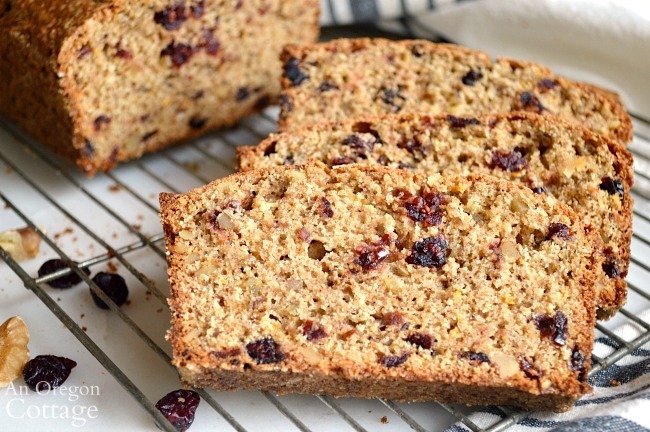 While the original recipe doesn’t call for cranberries, you can easily add dried cranberries (in place of the optional nuts) to this whole wheat, honey sweetened Applesauce Bread to give it another spin – yum! 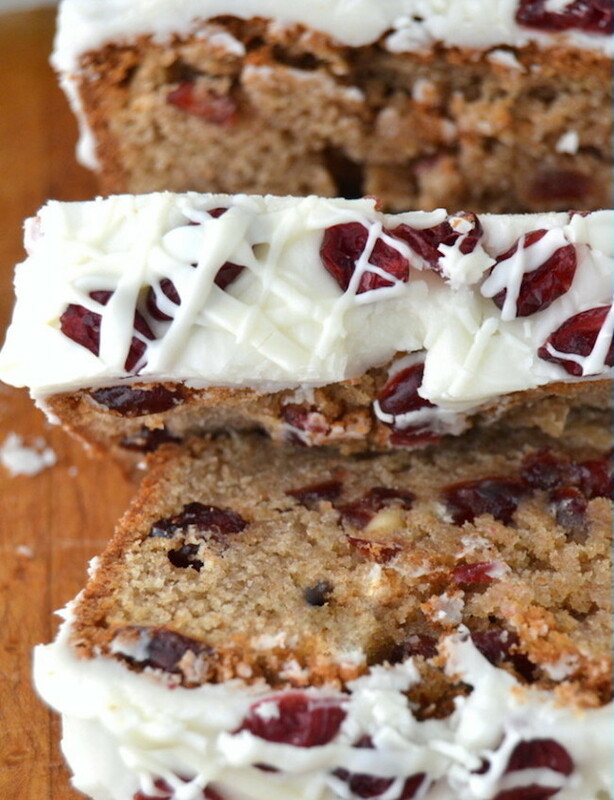 Classic Fresh Cranberry Nut Bread from Ocean Spray. Of course I had to include “the” cranberry bread from the producer of most of the cranberries in the US. Fresh cranberries and walnuts are a perfect pairing. 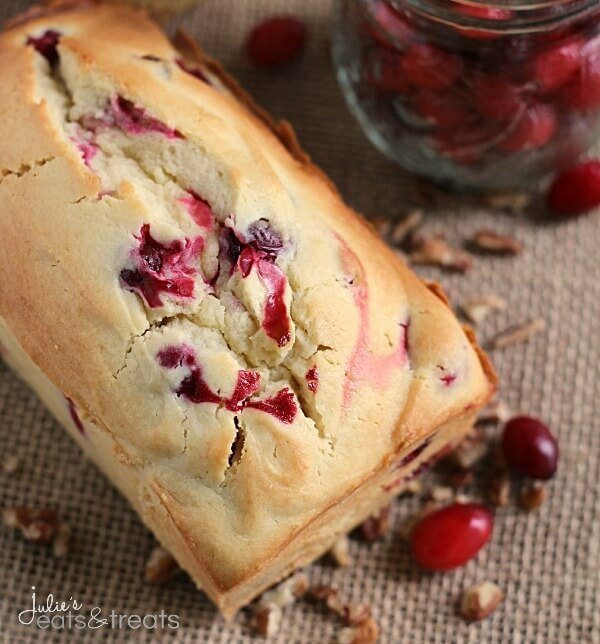 Cream Cheese Cranberry Bread from Julie’s Eats & Treats. Adding cream cheese with cranberries in a bread? Genius! I can imagine it tastes moist, rich and more desert-like. Better Than Starbucks Cranberry Bliss Bread from The View From Great Island. Every year I make a copycat cranberry bliss bar at the holidays, but I’d never thought to make it into a bread – what a fun option. Glazed Orange Cranberry Bread from Two Peas & Their Pod. 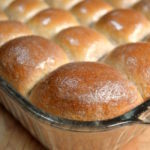 Goodness, I think this lovely bread would become the star of any brunch during the holidays, don’t you? No-Knead Cranberry Walnut Bread (artisan type) from Chez CateyLou. 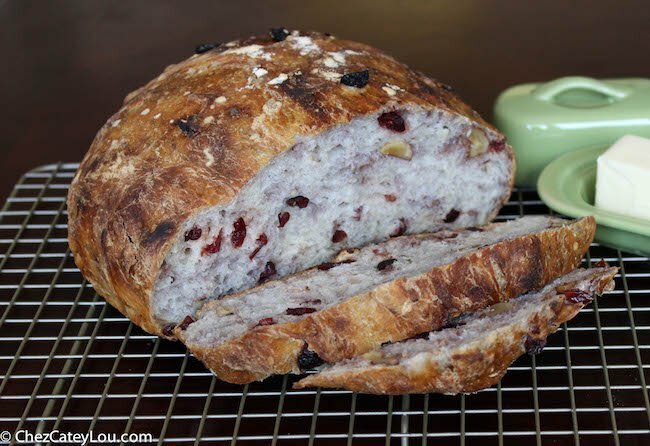 Have you ever thought about a savory bread with cranberries? I hadn’t, but this looks fantastic! It uses dried cranberries and walnuts in an easy yeast dough which certainly would be great any time of the year – cheese plate anyone? Gluten Free Cranberry Bread from Gluten Free on a Shoestring. Can you believe that light and lovely loaf is gluten free? It does use a gluten free flour along with xanthan gum, but if you’re GF, you probably have these in the pantry anyway. 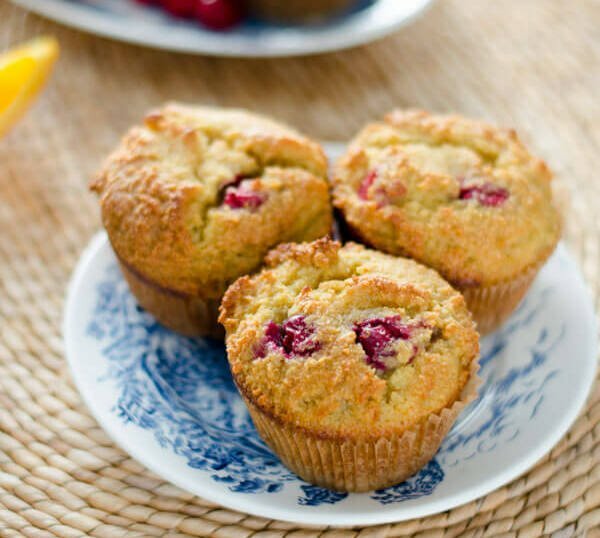 Gluten Free Orange Cranberry Muffins from Almost Supermom. These delightful looking muffins call for almond flour and other normal pantry ingredients, plus they’re sweetened with only honey and orange juice. You do not have to forgo holiday treats with recipes like this! Paleo Cranberry Orange Muffins from Cook Eat Paleo. These are similar to the previous muffin, using just almond flour, but they also use less honey and other ingredients. The recipe makes a batch of nine muffins, which is nice when you want a smaller amount. 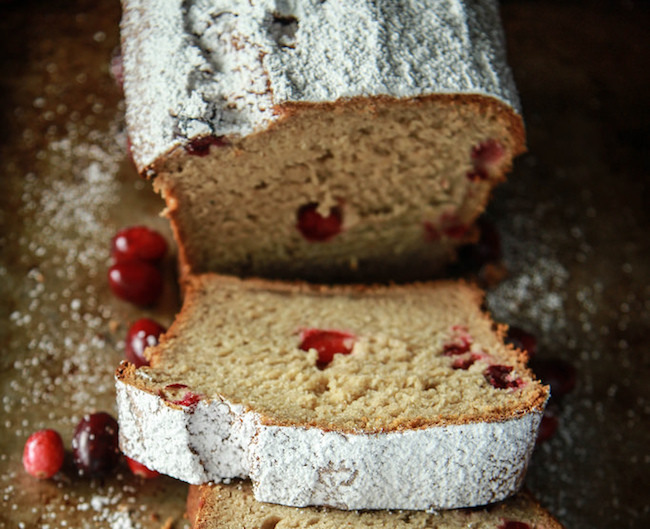 Vegan, Gluten Free Cranberry Applesauce Bread from Heather Cristo. This is more of a traditional loaf of cranberry bread using gluten free flour with the addition of applesauce for moisture and sweetness. 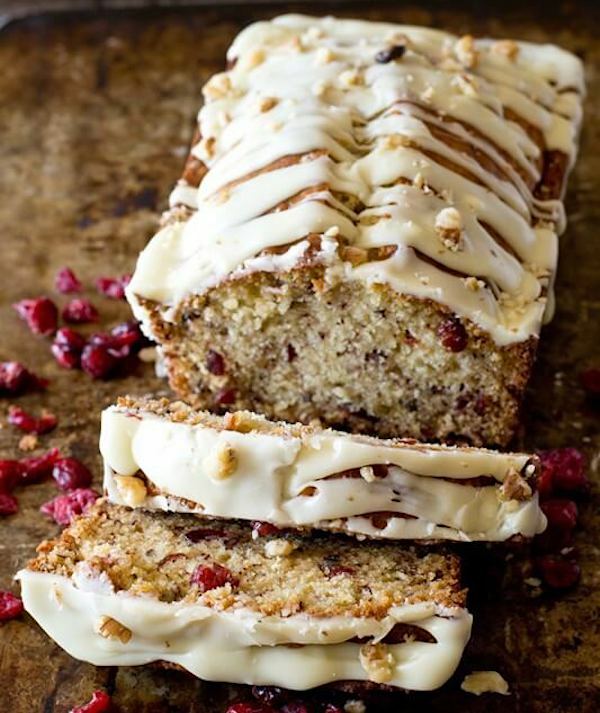 Cranberry Pecan Bread with White Chocolate Glaze from Tastes of Lizzy T. Um, adding a white chocolate glaze to a delicious loaf of dried cranberry and nut bread? Yes, please! Cranberry Walnut Oat Yeast Bread from Rachel Cooks. 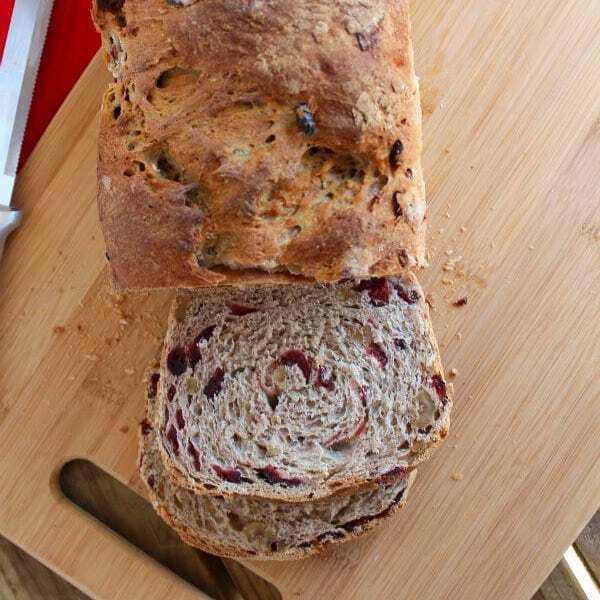 Here’s another yeast-based more savory cranberry bread to try. Can’t you just imagine this toasted and spread with butter? Move over cinnamon toast! Cranberry Pumpkin Muffins from Create Craft Love. 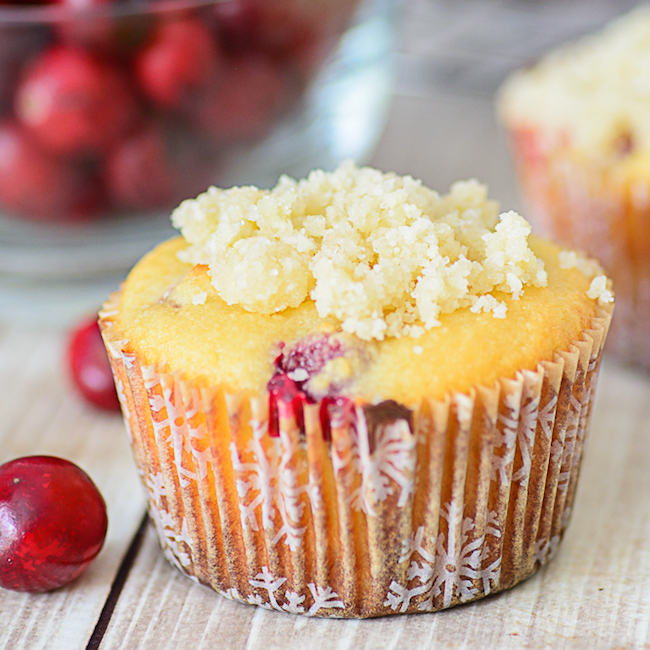 Why not add some cranberries to your pumpkin muffins? The cranberries will shine in with the brown sugar, spices, and pumpkin puree. 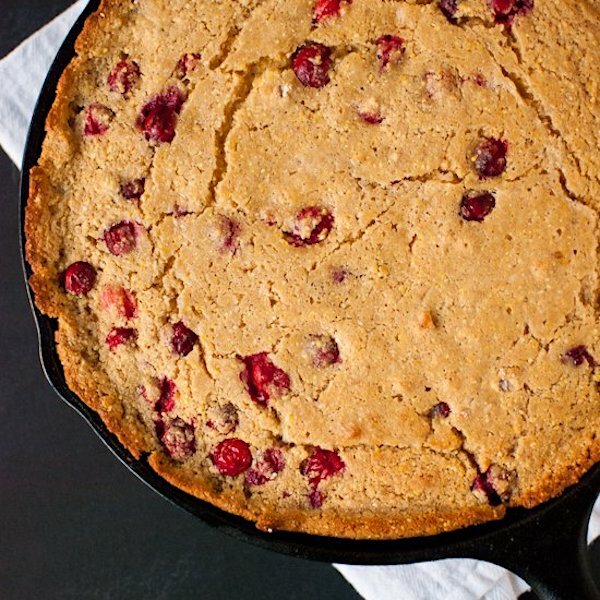 Cranberry Maple Skillet Cornbread from Cookie & Kate. 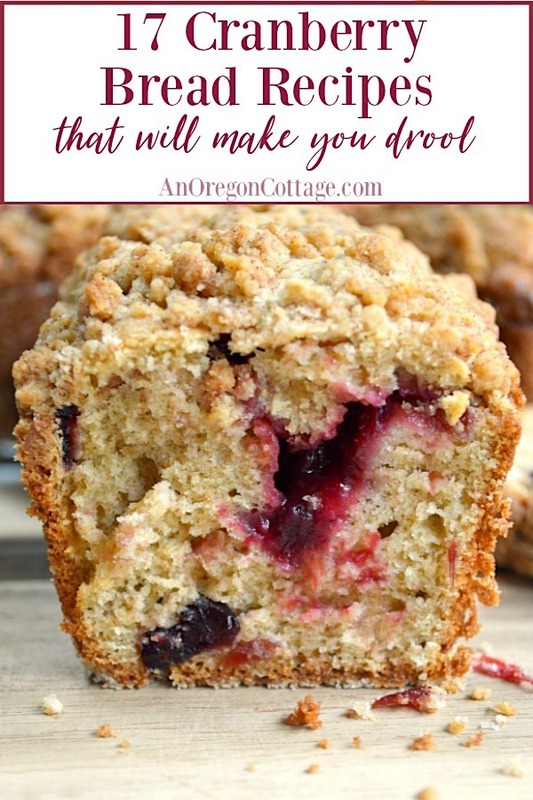 I love the idea of cranberry cornbread – what a fun change up from standard cranberry bread recipes. 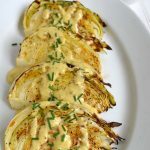 This recipe is sweetened only with maple syrup and uses whole wheat flour, plus it’s baked in a cast iron skillet to give it a nice crisp crust. 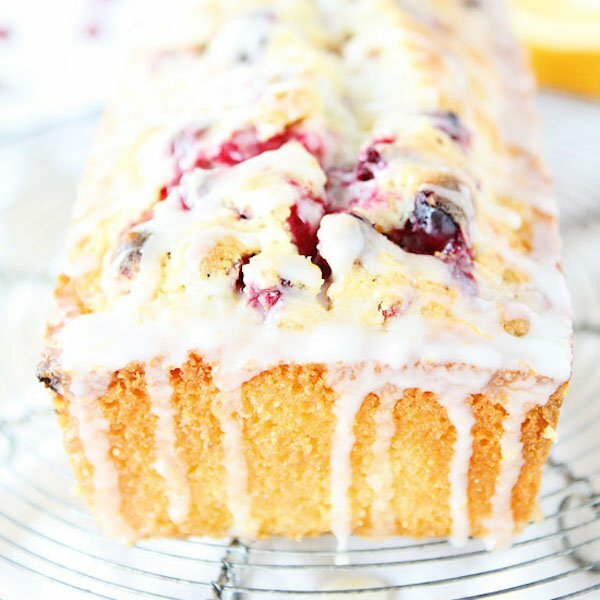 Cranberry Lemon Loaf from Domestic Superhero. Last, but certainly not least, we have a recipe that uses lemon with the cranberries. 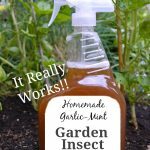 I don’t know about you, but this seems almost a perfect pairing to me and I have to try this soon! 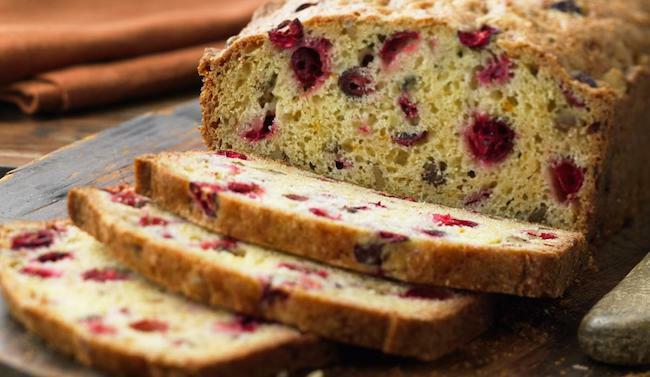 Which one of these cranberry bread recipes will you be making? And don’t forget that any of these would make great gifts as well as party and potluck additions. Bring on the cranberries! 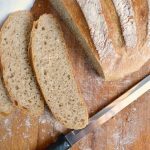 Don’t forget to check out all our best bread recipes here for more great quick, yeast, and sourdough breads. Subscribe & Grab Your Holiday Helpers! Welcome - I'm so glad you've joined the AOC community! Your first step is to check your email to confirm your subscription and you'll be on your way to your free printables. 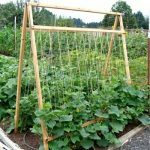 Jami Boys is an author, blogger, and imperfect do-it-yourselfer who lives in the green, lovely, and often rainy Pacific Northwest with her husband and two children. 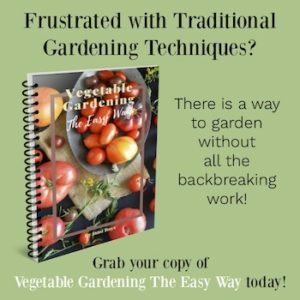 Her passion is to help others enjoy life & embrace simplicity through whole-food recipes, easy DIY projects, and do-able gardening. Copyright Note: While the copyright at the bottom of the page covers everything on An Oregon Cottage, permission is not required to use one image and no more than 2 lines of text IF you clearly provide a DIRECT LINK back to this source wherever the image appears. 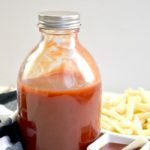 Please do not copy and publish full recipes. I appreciate all honest shares and features! Disclaimer: All content provided on An Oregon Cottage is for informational purposes only. 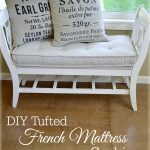 The owner of this blog makes no representations as to the accuracy or completeness of any information on this site or found by following any link on this site.